Membership definitely has it’s privileges. When you Subscribe to The Nourishing Home, you’ll receive a whole host of benefits including my free weekly GF Meal Plan Kits, two of my best-selling eBooks, and exclusive whole food recipes, healthy living resources and MORE! When you Subscribe to The Nourishing Home, you’ll receive my new weekly GF Whole Food Meal Plan kits that make it easier than ever to click-over to the recipes featured in each delicious family-friendly menu. • Prep Ahead Chart featuring helpful tips and recommendations for prep-ahead tasks that make putting healthy meals together a snap! • FREE eBooks! And last, but certainly not least … I’ve got some welcome gifts for you! When you Subscribe to The Nourishing Home, you’ll also receive my two best-selling eBooks for FREE! 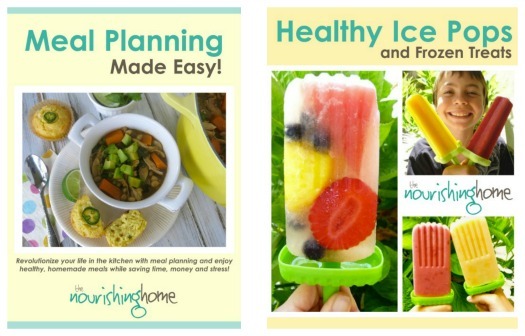 … Meal Planning Made Easy and Healthy Ice Pops & Frozen Treats! Woot! It’s my special welcome gift for new subscriber-friends like YOU! All you need to do is click here to subscribe. Then, be sure to *confirm your subscription (that’s really important!). Remember, as a subscriber, you’ll not only receive my FREE Weekly GF Meal Plan Kits – you’ll also receive delicious whole food recipes, and lots of special tips, resources and encouragement to help you and your whole family on your journey to living a more nourished life! *Please note: The first email you will receive after you subscribe is a confirmation email. It’s important to confirm your subscription in order to receive the free eBooks and weekly newsletter. So if you don’t receive an email in your inbox shortly after subscribing, please be sure to check your spam folder as those silly spam filters can get a little overzealous at times. I just found this site and am thanking GOD! I have been looking for this kind of info and ideas in just this type of fashion. AWESOME website!!! Thanks!!! I love the site. It’s lovely and colorful! So excited! I’ve been waiting for this blog!! 🙂 Awesome! Can’t wait to read it all! Awesome job Kelly! I am spreading the word! Thanks for sharing with everyone your amazing fun and helathy foods! Thanks, Natalie. You should get an email from The Nourishing Home tomorrow at some point, just scroll to the bottom and look for the picture of the eBook, you’ll see the link to download it there. It may take a few minutes because it’s a LARGE file due to all the photos. 🙂 Hope you enjoy it!! Hello, just found your blog,subscribed allready, loving it. I’ve signed up to get your emailed posts and have received nothing. I did get a confirmation email that I clicked on to confirm, but I’ve been waiting to receive an email about the Healthy Ice Pops recipe and have not received anything. I tried signing up, and had a message that I am already signed up. I enjoy your site very much and love your testimony of Christ! Thanks so much, Kelly! I was able to find the link in your email and print it out! I can’t wait to try these! Thanks for the great website as well – I am in the middle of slowly converting me and my family to eating healthier in the Gluten-Free way. Thanks for the info you have on your website. How do I get the free ebook? I’m already subscribed, but cannot find the grocery list for this week. I’ve tried all the links in the email and tried clicking within the next week’s meal plan. Am I missing something? I have been able to access previous grocery lists. I have been a subscriber for quite some time. I would like to get the free e-book but couldn’t find a link for those who are already subscribers. If I have already received this, I am not aware of it. Can I still get it? One of my students just sent me a link to your website and it is terrific! I was surprised when I read your story because I was diagnosed with IC in 2010. I have found relief through my version of the paleo diet. The only grain I can tolerate without aggravating my symptoms is corn. With a combination of diet, stres reduction, exercise, and western medicine, I feel good most of the time. Thank you for sharing your story! 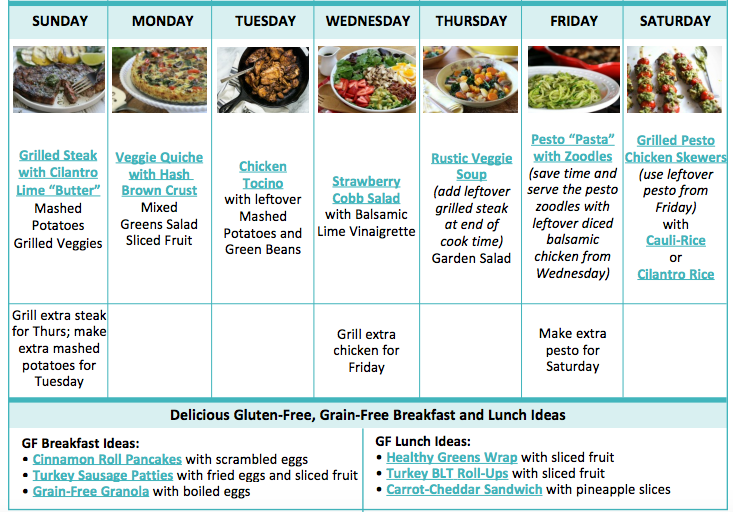 Thank you so so so so so much for these meal plans. You have no idea how you have helped revolutionize dinnertime for us! With two under two life gets really hectic right around dinner and I am so glad I can have healthy meals to throw at my family when I’m so done! 🙂 I am just very thankful for these! You are so welcome, Kayla! It’s a pleasure and an honor to serve precious families like yours. 🙂 I appreciate you taking the time to leave a kind note. I so appreciate your site and ministry! I’d love to try the meal plans but wondered if you have any vegan meal plans. Our family has always eaten meat but recently my little ones were diagnosed with an autoimmune disease and one of the struggles is an inability to digest meat. Yikes! I’m really struggling to meal plan and so desire to have that calm and important family dinner time. I so appreciate any help you can give. This looks wonderful! Do you know if there is a vegetarian or vegan plan like this somewhere? Hi Kelly! This site is a blessing! I am homeschooling my 6- and 4-year-olds while keeping my 2-year-old busy and nursing my 6-week-old. I have my hands full! Meal planning had become laborious until I found your site. Thank you so much! I came from a link through MSM, but I get an error when I try to subscribe. Is there a problem there? Your site looks great and has real food, which I love. The GF is also great. The meal plans and grocery lists are very helpful. I’m no longer stuck trying to figure out a meal for my family. I have a busy schedule and now find I’m not trying to fit in a healthy meal plan and grocery list. Nope, still not working for me. It tells me that the page cannot be found. Can I just e-mail you my information? So strange, I checked it and it’s working. Yes, email me your email and I will sign you up, but you’ll have to confirm when you get the confirmation email from feed burner. Sorry for the trouble!